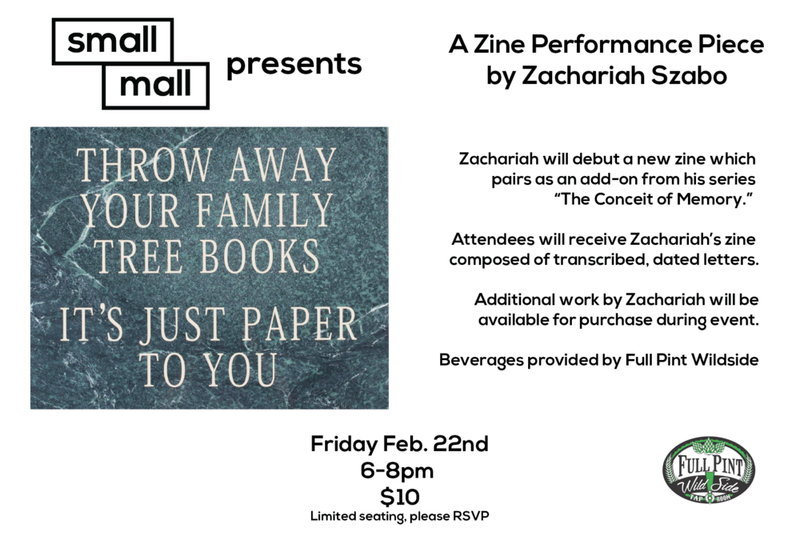 Join us for an zine-filled evening with Small Mall featured artist Zachariah Szabo! Zachariah will debut a new zine which pairs as an add on from his series The Conceit of Memory. Included with entry fee, attendees will receive zine of their own made by Zachariah composed of transcribed dated letters. The event is audience interactive and attendees will get the chance to either read or perform a letter within the zine. In addition, prints from The Conceit of Memory will be available at the shop. Additional work by Zachariah will be available for purchase during the event. Full Pint Wild Side Pub will be providing beverages for the evening. Tickets are $10. Limited seating. Zachariah Szabo is an artist currently based in Pittsburgh, PA. A native of the midwest and a former competitive figure skater and dancer, his work explores personal identity, loss, reference and subculture through photography, video and mixed media. His work has been collected privately across the US and Europe. Full Pint Brewing Company opened its doors as a production brewery in 2009. Since then, they have opened two on-premise pubs, including the Wild Side pub in Lawrenceville, and expanded distribution into several states. Although their flagship brew, White Lightning, has always been a primary focus, founders/brewmasters Barrett Goddard and Sean Hallisey use their 35+ years of professional brewing experience to craft everything from Flemish style sour ales to chili pepper Berliner Weisse.